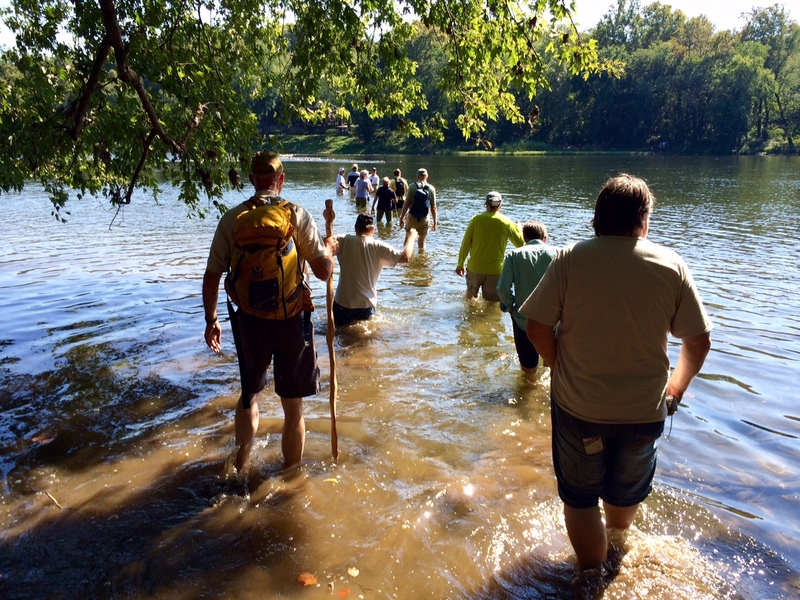 Taking the plunge on Sept. 19, 2015: Civil War enthusiasts cross the Potomac River at Boteler's Ford. Panoramic view of the Potomac shows the West Virginia and Maryland sides. Antietam battlefield guide Jim Rosebrock (left) and your friendly blogger in the Potomac. 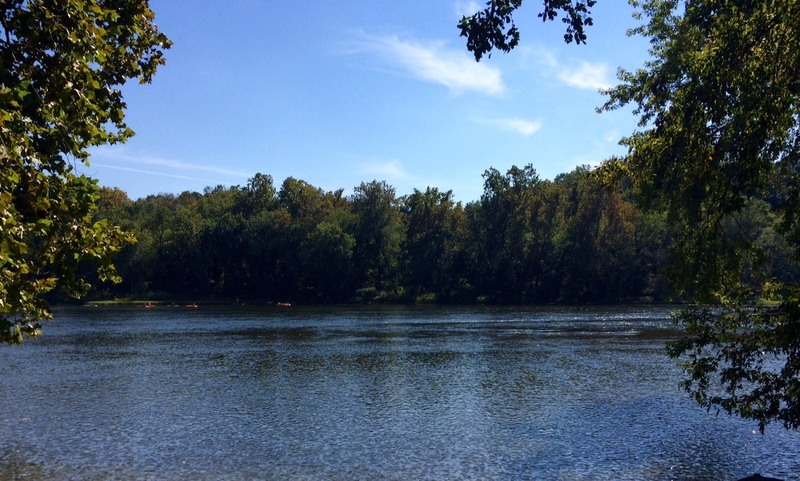 Armed with an iPhone, determination and knowledge that the water was only waist-high at its greatest depth, I waded the Potomac River from Maryland to West Virginia at Boteler's Ford with nearly 40 other Civil War nuts. Clutching my phone like a thief grips a large bag of cash, I aimed to document the 250-yard crossing and subsequent tour of the seldom-visited Shepherdstown battlefield on the opposite bank. Our mission Sept. 19 was accomplished nearly flawlessly -- only two people slipped on the rocky river bottom and plunged into the clear, cold water. Meanwhile, I nervously shot photos while standing precariously in the middle of the Potomac. on a historical sign on the West Virginia side of the Potomac. A brief history lesson: The Maryland Campaign didn't end with the Battle of Antietam on Sept. 17, 1862. One hundred and fifty-three years before our visit, Union artillery on the Maryland side of the Potomac pounded exhausted Rebels on the Virginia side at Shepherdstown. (It became West Virginia in June 1863.) Later, two Union regiments crossed at Boteler's Ford into Virginia, capturing four artillery pieces from the Rebels' rear guard. Thus alerted, Robert E. Lee sent A.P. Hill's division to the ford to stop the Yankees' pursuit. 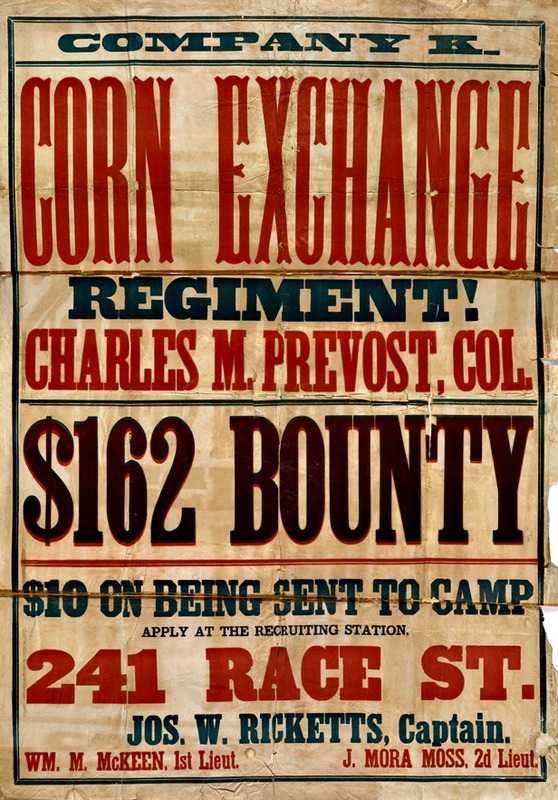 In its first battle of the war, the 118th Pennsylvania, the 767-man Corn Exchange regiment, suffered the worst: 64 killed, 124 wounded and 94 missing. It was a "sad and purposeless affair, with a most disastrous and fatal termination," a regimental historian later wrote. Total casualties for both sides at the Battle of Shepherdstown were more than 600, far less than the 23,000-plus at Antietam, but the Union army's pursuit of Lee was over. landmark at the Battle of Shepherdstown, appears in distance. When I lived in the area in the 1980s, a friend and I hunted for Civil War relics on bluffs down river from Shepherdstown but found only soda and beer can tabs, bottle caps and other trash. During my frequent visits to Shepherdstown over the years, I often stopped to read the old, black-and-white historical marker on the West Virginia side of the Potomac that briefly mentions the battle. I was also familiar with the nearby ruins of the cement mill, often mentioned in battle accounts, but otherwise my knowledge of what happened there in late-summer 1862 was limited. So when an opportunity arose to tour the battlefield with members of the excellent Shepherdstown Battlefield Preservation Association, I jumped at the chance. Two groups made the trip -- one led by Maryland Campaign expert Tom Clemens and another by young historian Kevin Pawlak, author of a recently released book on Shepherdstown's Civil War experience. 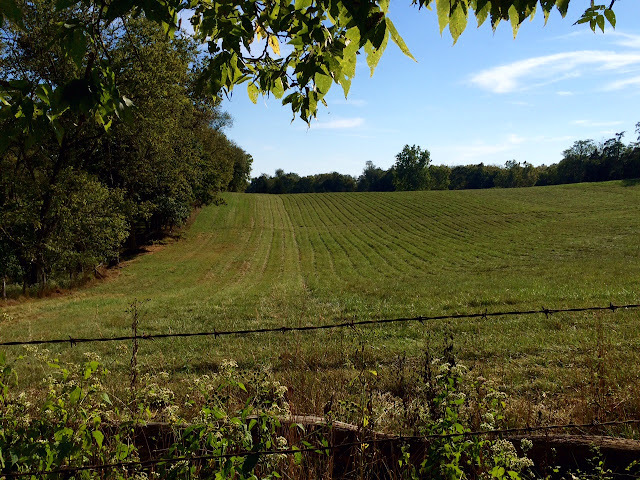 The SBPA has been instrumental in helping preserve parts of the battlefield, much of which is privately owned, and an effort to incorporate it into Antietam National Battlefield is under consideration. In a Harpers Weekly illustration on Oct. 11, 1862, the 118th Pennsylvania prepares to cross Potomac. 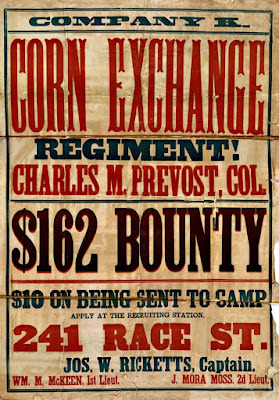 Recruiting poster for 118th Pennsylvania. Corn Exchange Association of Philadelphia. My take: As 118th Pennsylvania soldiers did during their crossing 153 years earlier, many of us laughed and joked before we waded the river. But things got more serious once we entered the Potomac. Although the current wasn't swift, the river bottom was uneven and slippery, a chore for some of us to easily navigate. I nearly fell twice, a disaster waiting to happen for my precious iPhone. To my knowledge, none of us carried a musket or other accoutrements, which surely made the crossing a challenge for Rebels and Yankees in 1862. After Antietam, Lee's army crossed Boteler's Ford at night, with the aid of torches. Try that sometime. From the 118th Pennsylvania history: "Dew glistened on grass and leaf, and the old Potomac, calm and placid as if it had never known strife, visible for a considerable distance, swept on its course tranquilly. The landscape, varied with its valley and hillside, its meadows and woodlands, sprinkled with barn, house and garden, was peacefully picturesque in the refreshing sunlight of a soft September morning. There were no harbingers that by noon-day the regiment should suffer casualties, severer for a single combat than probably ever fell to the lot of soldiers, even in the heaviest battles of the war. "An early breakfast was interrupted by orders to move. The meal completed, the brigade started in the direction of the river. With a few hurried personal preparations, some of the men removing their shoes and stockings, the column at 9 a.m. began the passage of the stream at Blackford's Ford. There was a good deal of pleasant shouting as the troops splashed through the stream, and roars of laughter greeted those who, less fortunate than their fellows, stumbled and fell headlong into the water." Rebels advanced toward the camera across this field to attack the Union army. The Union Army's V Corps briefly held its ground in this field atop the bluffs. 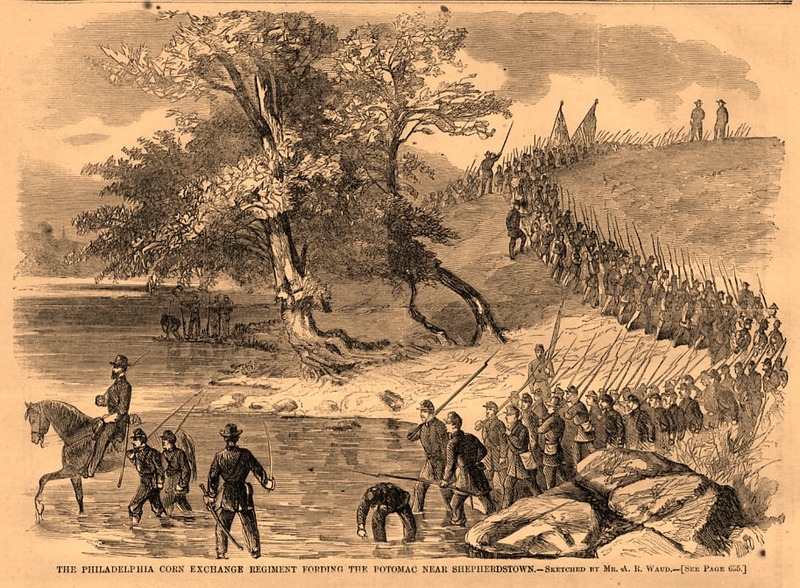 My take: In pursuit of the Rebels, the 118th Pennsylvania waded across the Potomac unmolested and then marched through a wooded ravine to a plateau above the river. We followed the route in another ravine, making our way past ruins of cement kilns and up the steep slope to a large field. I made a makeshift walking stick from a large tree branch to help navigate my way to the top. The ground atop the bluffs on which the 118th Pennsylvania fought is mostly woods today and was inaccessible during our tour. We were granted special access of the private property. At Shepherdstown, the 118th Pennsylvania was plagued by poor leadership and bad luck. Outnumbered by the Rebels on the plateau above the river, most of the Union V Corps retreated back across the Potomac into Maryland. But the 118th Pennsylvania remained because its commander, Colonel Charles Prevost, thought an order to retreat had not come through the proper chain of command. In the thick of the fight, the regiment discovered that some of its newly issued Enfield rifles were defective. The spring of the hammer in some of the muskets did not explode the percussion caps. The rout was on. From the 118th Pennsylvania regimental history: "The enemy had now succeeded in pressing as close to the front as fifty yards,| and the hot fire at such close range was increasing the casualties with frightful fatality. At the same moment he succeeded in developing a regiment across the ravine, completely covering the entire right. The two right companies, under the immediate supervision of the colonel, promptly changed direction by the right flank and gallantly checked the manoeuvre. This movement, mistaken by the hard-pressed centre for a withdrawal, induced it to break temporarily, and with the colors in the advance move in some disorder order to the rear. Colonel Prevost caught the disorder in time to promptly check it. Heroically seizing the standard from the hands of the color-sergeant and waving it defiantly, he brought the centre back again to the conflict and completely restored the alignment. He was still waving the flag in defiance at the enemy when a musket-ball shattered his shoulderblade and he was borne to the rear by Corporal Francis Daley, of Company E. The severity of his wound forced him to withdraw entirely from the action." 118th Pennsylvania soldiers were seriously injured or killed when they scrambled down the jagged cliff. Captain Courtney O'Callaghan was seriously injured when he made his escape down a cliff. 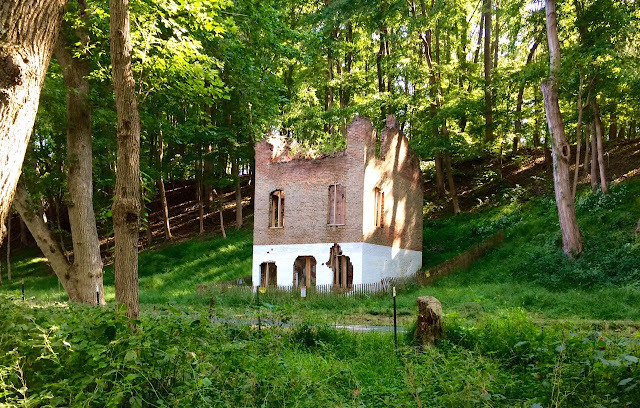 My take: I've driven down the River Road on the West Virginia side of the Potomac dozens of times, but never knew about the terrible, and heart-rending, events that happened there in September 1862. Some 118th Pennsylvania soldiers were shot down by the Rebels from the bluffs as they attempted to escape through the wooded ravine. 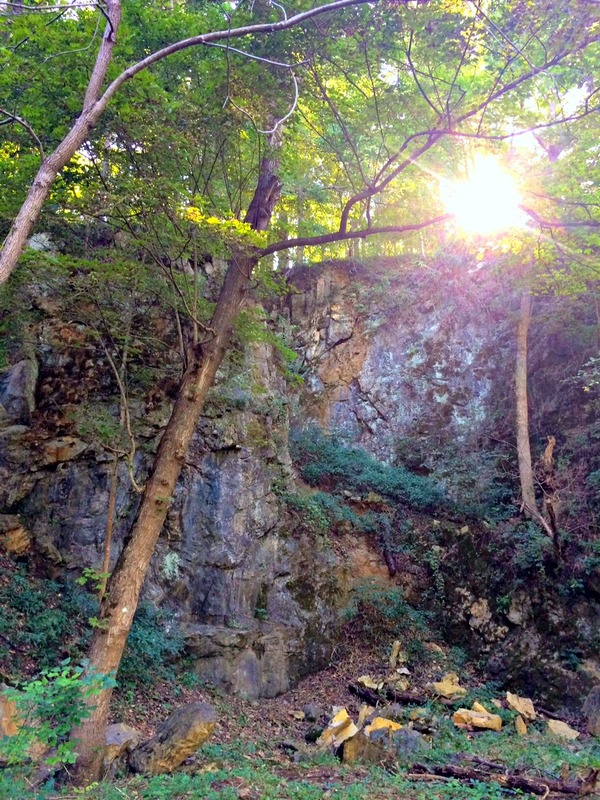 Others leaped or somehow scrambled down the imposing 100-foot cliffs, often with deadly results. They must have been scared out of their minds. "The men poured like a cataract over the edge and down the declivity," a soldier in the 32nd Massachusetts remembered, "and so long as they stayed at its immediate base they were tolerably safe, but their assailants soon gained the edge of the bluff and lying flat, could pick off any who attempted to cross to the Maryland side, and many were killed or wounded or drowned before our eyes." Ephraim Layman: A musician, he was shot along the river's edge and lay there, his feet in the water, until he was removed under a flag of truce the next afternoon. 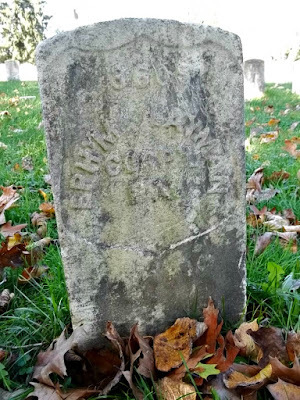 He died at a makeshift hospital in Sharpsburg on Sept. 21 and lies buried in Antietam National Cemetery. Private William Madison: Many of the fleeing Pennsylvanians attempted to escape to the Maryland side across a slippery, ramshackle 10-foot-wide dam-breast. Others were shot while they swam or waded across the Potomac. One who barely made his escape via the dam was 46-year-old Madison, who was peppered with five shots, including one that shattered his jaw. 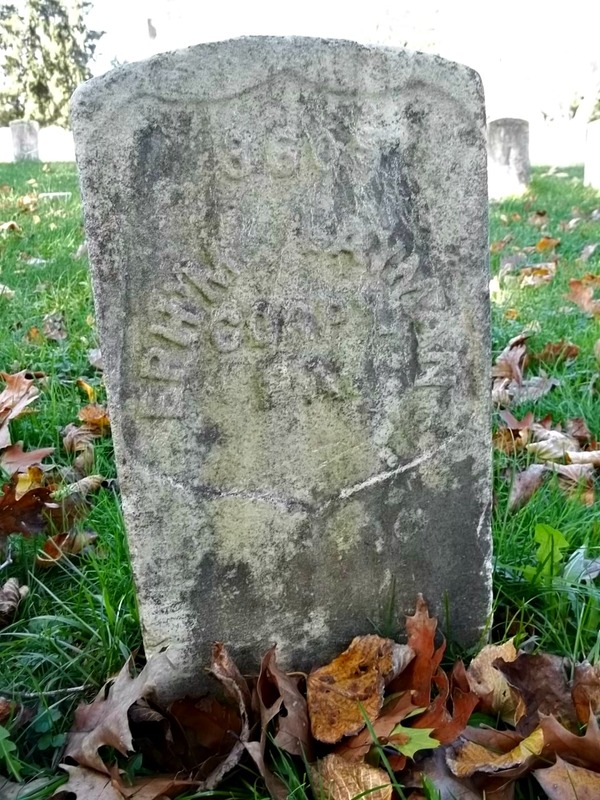 "He vented his anger in a frightful howl," according to the 118th Pennsylvania regimental history, "and facing squarely about gave his enemies the last shot he ever fired in the army, for his wounds terminated his service, but not his life." Madison survived the war. From the 118th Pennsylvania regimental history: "The greater part of the regiment made furiously for the ravine, down which they dashed precipitately. Since the march up, a tree, in a way never accounted for, had fallen across the path. This materially obstructed the retreat. Over and under it the now thoroughly demoralized crowd jostled and pushed each other, whilst, meanwhile, the enemy, having reached the edge of the bluff, poured upon them a fatal and disastrous plunging fire. The slaughter was fearful; men were shot as they climbed over the tree, and their bodies suspended from the branches were afterwards plainly visible from the other side of the river." 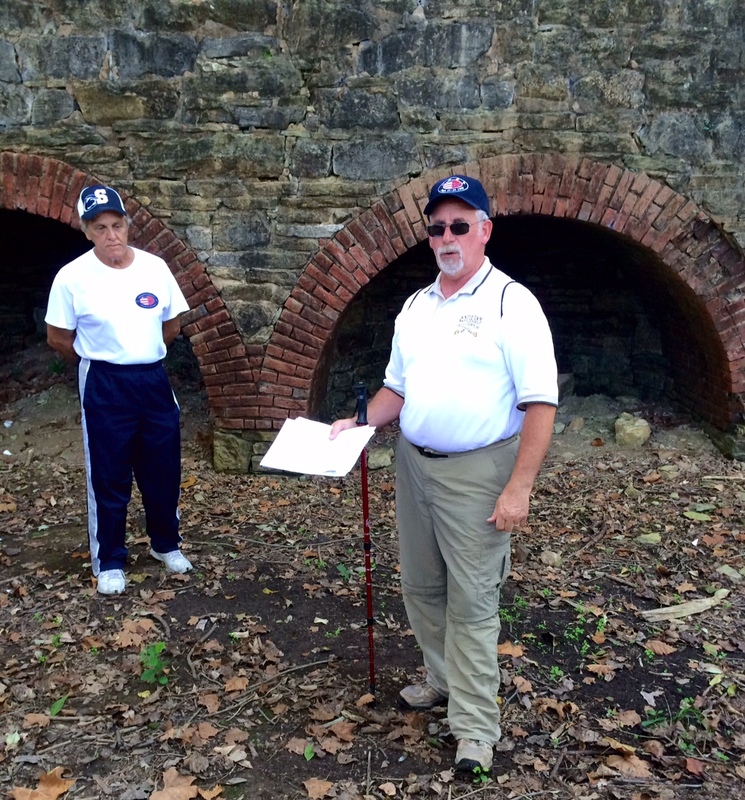 Maryland Campaign expert Tom Clemens explains the significance of the cement kilns. Ruins of old cement kilns on West Virginia side of the Potomac. The first three arches are post-war. 118th Pennsylvania soldiers sought refuge in this arch after they were routed on the bluffs. 118th Pennsylvania soldiers were killed or seriously wounded by friendly artillery fire here. 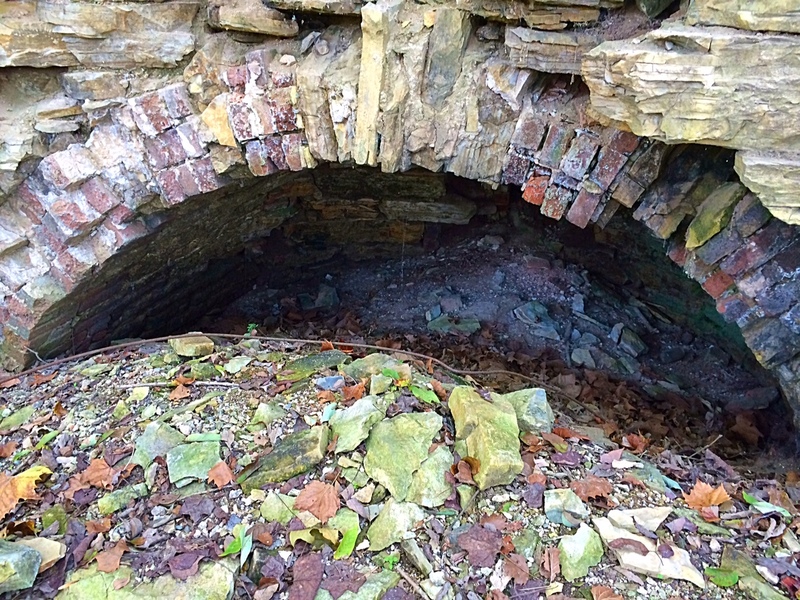 My take: Hidden from view from the River Road, these old cement kilns provided refuge for 118th Pennsylvania soldiers after they were routed atop the bluffs. I remember visiting here in the early '80s, checking out the graffiti-covered ruins but not realizing this was a place of death. Huddled in or near the arch in the fourth photo above, several 118th Pennsylvania soldiers were killed and others were seriously wounded when shells fired by Federal artillery on Maryland side of the Potomac fell among them. From 118th Pennsylvania regimental history: "At this moment a battery from the Maryland side opened heavily. The practice was shameful. The fuses, too short, sent the terrible missiles into the disorganized mass fleeing in disorder before the serious punishment of the enemy's musketry. It was a painful ordeal, to be met in their effort to escape an impending peril by another equally terrible. Shell after shell, as if directly aimed, went thundering into the arches, bursting and tearing to pieces ten or twelve of those who had crowded there for cover. "A cry and wail of horror went up, plainly heard above the din and roar of battle. Waving handkerchiefs fixed to ramrods, they endeavored by their signals to warn the gunners to desist, but to no avail; the fatal work continued. Hoping for better treatment, numbers turned with their white insignia of truce towards the enemy and, again ascending to the hill-top, surrendered. The artillerists continued to pound away with an ardor indicative of satisfaction, until Captain B. F.Fisher and Lieutenant L. R. Fortescue, two officers of the Signal Corps, fortunately detected, with the aid of their long-range telescopes, the damage inflicted, when lengthened fuses and better practice brought their aim more directly towards the accomplishment of its intended purpose." Ruins of cement mill office building. 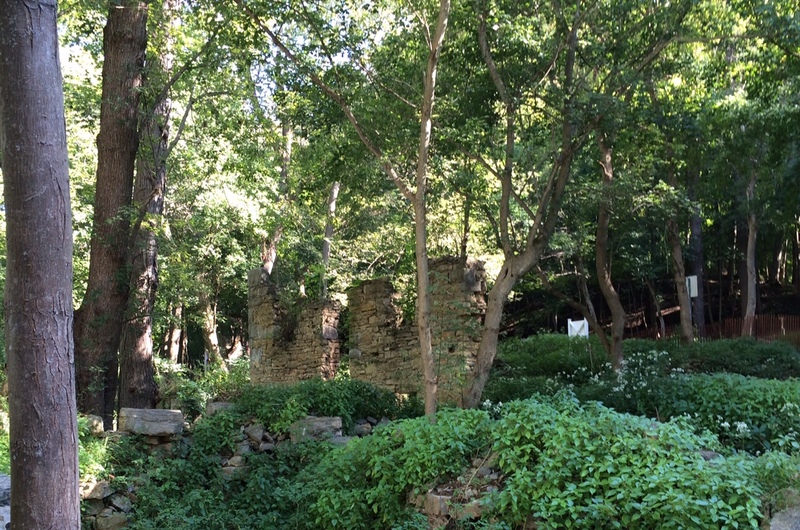 Another view of the ruins of a cement mill office building , which faces the Potomac River. 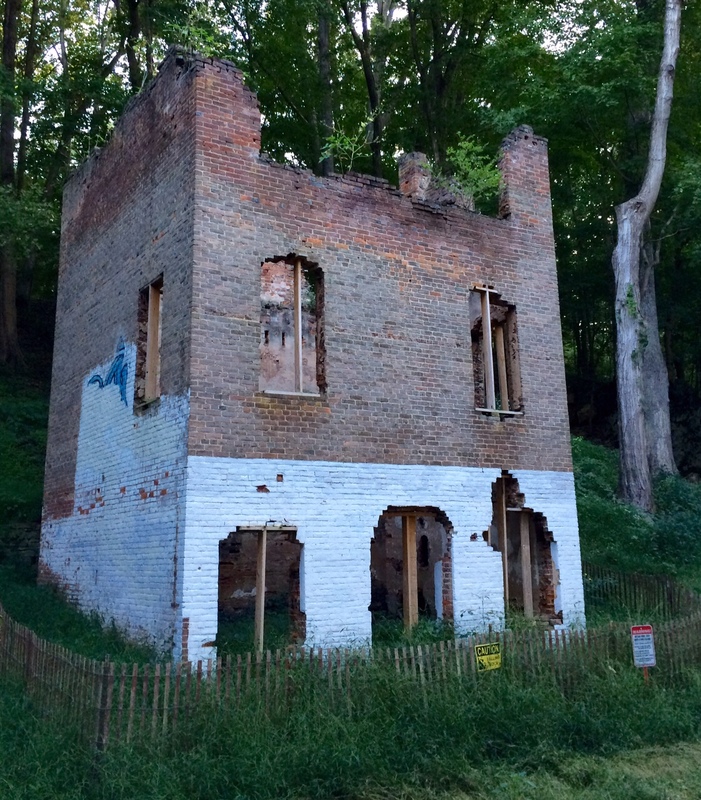 Rebels poured fire from this building into the Yankees, who attempted to flee across the Potomac. My take: Just off the River Road, we found ruins of the old cement mill, from which Rebels fired upon Yankees who attempted to escape across the river. After he somehow made it to the Maryland side of the river, 118th Pennsylvania Lieutenant J. Rudhall White was greatly relieved. "Thank God, I am over at last!" said White, a Virginia native. Suddenly, a bullet tore through his bowels, mortally wounding the 20-year-old soldier who began the war in the Rebel army. Perhaps the fatal shot came from one of the buildings above. 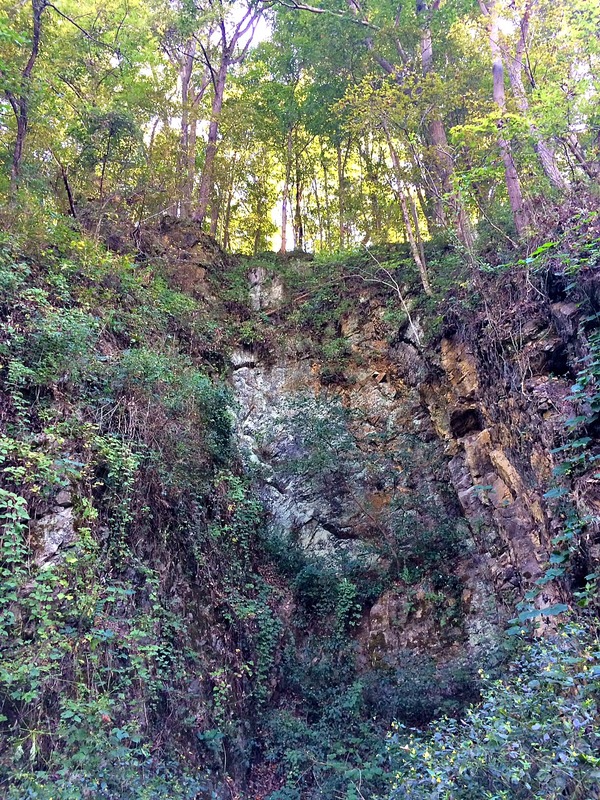 From 118th Pennsylvania regimental history: "An old abandoned mill stood upon the ford road, at the base of the cliff. It completely commanded the ford and the dam-breast. When the last of the fugitives had disappeared from the bluff, the enemy crowded the doors, windows and roof and poured their relentless, persecuting fire upon those who had taken to the water. Numbers, observing the telling effect of the fire upon those who had essayed to the venture of crossing, huddled together and crowded each other in the arches at the base of the bluff; whilst others, hoping to escape the fatal effect of the avenging bullets, took to deeper water and crossed where the stream was deep enough to cover the entire body and leave the head alone exposed." Pack Horse Ford, among other names. My take: There are thousands of examples of heroism and courage during the Civil War. 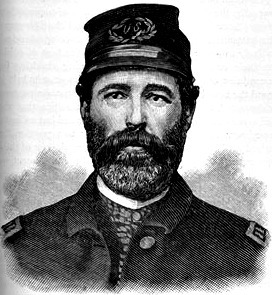 One of the lesser-known stories of valor involves Lemuel Crocker, a 33-year-old captain in the 118th Pennsylvania. 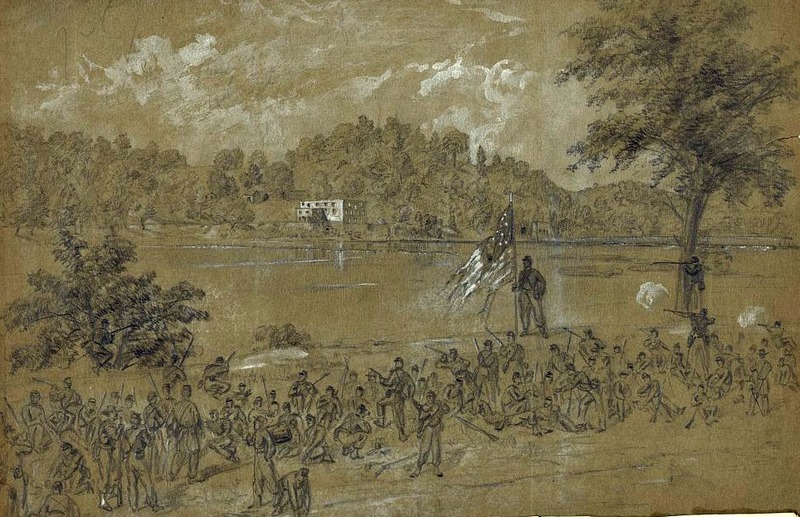 A day after the battle, wounded and dead from the Corn Exchange regiment were scattered across the Virginia side of the Potomac. Crocker, who had served in the Union army for barely a month with the regiment, aimed to do something about it. Disobeying an order from Union V Corps commander Fitz John Porter forbidding his mercy mission, Crocker crossed the dam from Maryland to the Virginia side of the Potomac to help his wounded comrades. One by one, Crocker, a large, muscular man, carried bodies of dead and wounded to the river bank, where an orderly for Porter told him he would be shelled by Federal artillery if he continued. "Shell and be damned," replied Crocker, who continued his work. A Rebel officer allowed Crocker to retrieve other wounded and even pointed out a small boat in which he could take the soldiers back to the Maryland. Upon his return, Crocker was promptly arrested and reprimanded by Porter. Figuring a stern reprimand was enough punishment, the commander released Crocker for his "unquestioned courage" and allowed him to return to duty. Like this Rebel soldier, Lemuel Crocker merits a statue somewhere for his heroism, too. 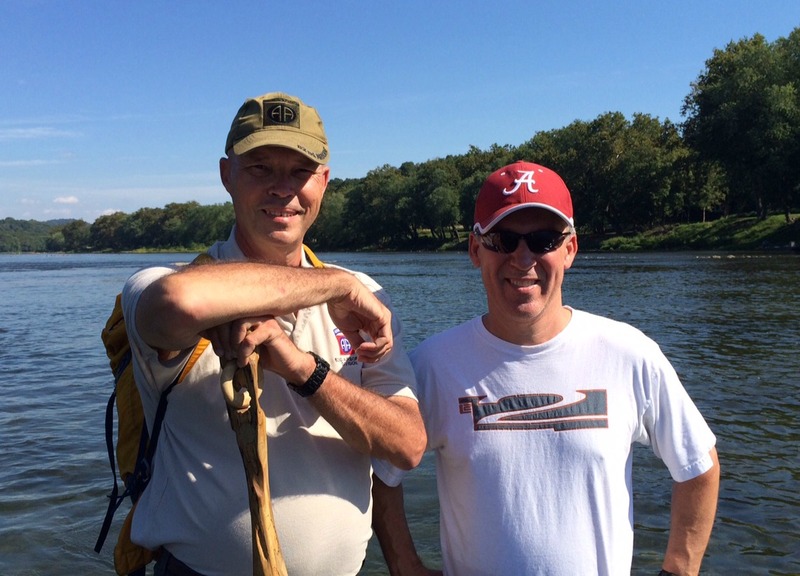 wounded comrades on the Virginia side of the Potomac. From the 118th Pennsylvania regimental history: "The fight was a sad and purposeless affair, with a most disastrous and fatal termination. Yet it secured for the regiment a reputation among its new associates for staying qualities which, maintaining it thoroughly, as it did, down to the very end, bore most excellent fruits. in feeling, sentiment and purpose. "The 118th's reception in the brigade was not attended by any joyous, gladsome shouts, nor was it exempt from the intimation that its presence at the front was largely due to the paltry shekels. The stolid indifference it met at every hand during the few days previous to the fight was frequently accompanied with epithets apparently intended to be enduring : 'Here come the $200 boys from Philadelphia,' and others of like import. The affair at Shepherdstown, though, wiped everything out. That was a crucial test, and one which conquered the prejudices of men whose trials of battle fitted them to judge of the worth of their fellows. Opprobrious allusions were changed to plaudits, and, for months afterwards, the command was pointed out everywhere to strangers as 'the men who fought at Shepherdstown.' "
Superb story of what happened at the Potomac crossing when the Union army tried to pursue the Confederates immediately after the Battle of Antietam. So many informed Civil War buffs think McClellan could have destroyed Lee's army before they retreated back deeply into Virginia. Your story and the words you shared of those who fought in the 118th Pennsylvania certainly suggest that the Confederate army still had a lot of fight left when it reached the Virginia shore. What an amazing story, made even better with the photos. Thanks for sharing this with us.